It showcases a vast tribute of almost 300,000 handcrafted poppies.. The ambitious display will honour all servicemen and women who have fought across all wars, conflicts and peacekeeping operations over the last 100 years. Acclaimed landscape designer Phillip Johnson has teamed up with the creators of the 5000 Poppies Project to showcase a vast tribute of almost 300,000 handcrafted poppies at 2016 RHS Chelsea Flower Show from 24-28 May 2016. The ambitious display will honour all servicemen and women who have fought across all wars, conflicts and peacekeeping operations over the last 100 years. This unique event is being made possible through the support of the Victorian Government and Qantas. Phillip Johnson’s ambitious, elegant design for Chelsea will incorporate a stunning selection of poppies from 50,000 contributors from across the globe. 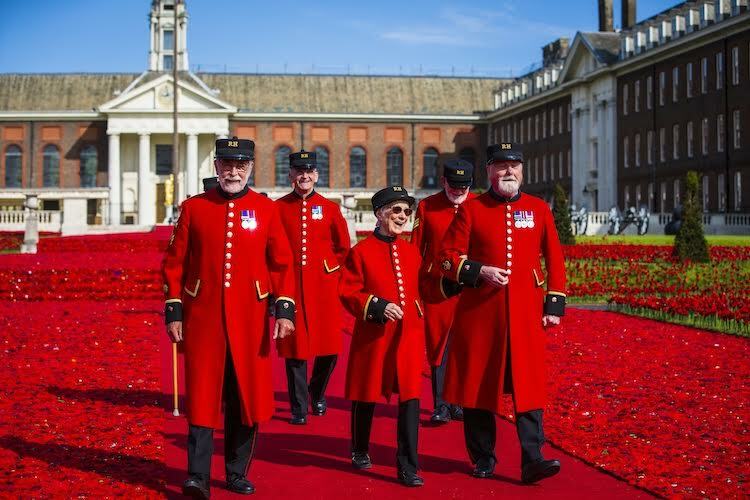 The design features a simple central geometric installation, complemented by more than 25,000 stemmed poppies extending into the manicured lawns of the Chelsea Hospital. Overall the design will cover almost 2,000 sqm (21,500 sqft). This will be the first time that the RHS Chelsea Flower Show has connected into the grounds of the Royal Hospital Chelsea in such a dramatic way, and RHS Chelsea organisers expect the installation to be a highlight at the Show. This vast project came from humble beginnings and sparked massive international community interest. 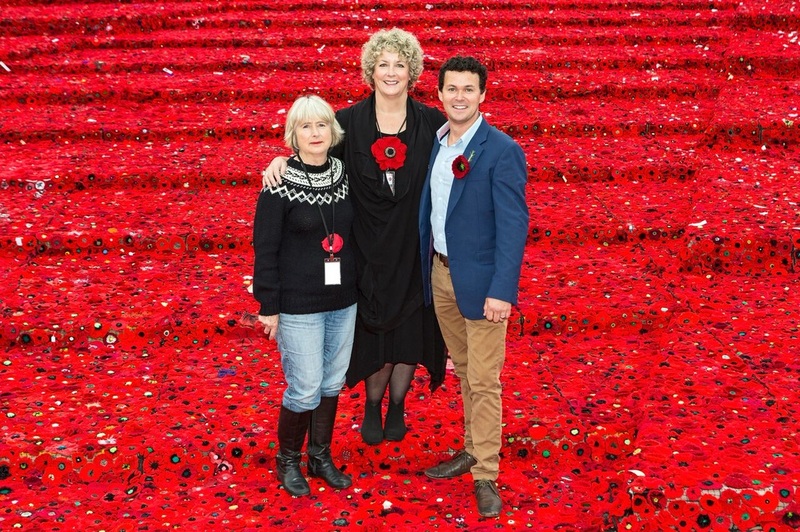 In 2013, Australian creators Lynn Berry and Margaret Knight set out to crochet just 120 crocheted poppies to plant at the Shrine of Remembrance in Melbourne in honour of their fathers who both fought in WWII. A huge outpouring of community spirit and creative energy took this project to an unprecedented scale. 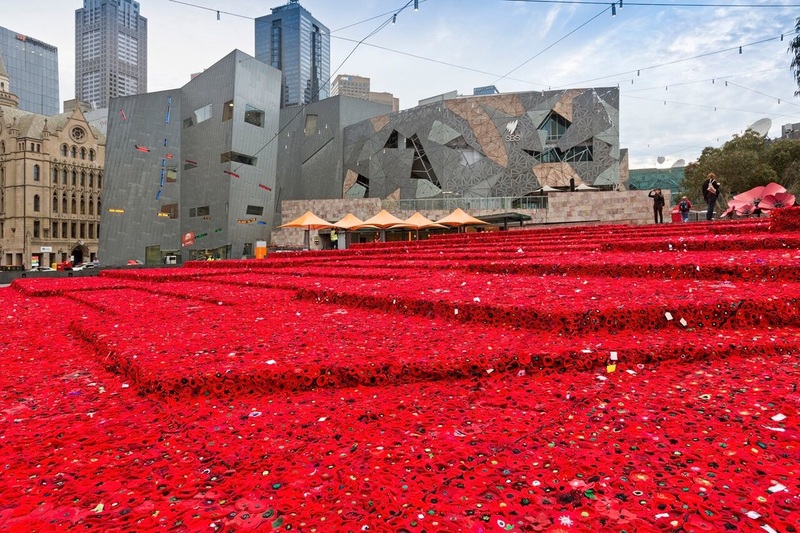 By Remembrance Day 2013 more than 5,000 poppies had been collected, and by Anzac Day 2015 the total was well in excess of quarter of a million poppies from contributors around the globe. The result was a spectacular visual tribute in Melbourne’s landmark Federation Square and on Princes Bridge, and led to an invitation to showcase at RHS Chelsea Flower Show. The aim to honour all servicemen and women reflects the way that the project has grown to include many contributors from other countries and cultures. The generous assistance of the Victorian Government and Qantas has been instrumental in allowing this massive community undertaking to travel to London.